As the gold market takes a break in its journey to much higher levels, it is good to step back a bit and understand why gold has appreciated so dramatically in the last 100 years and why this will continue for many years to come. Most people have no idea what money is. They believe that if they have 100 dollars or euros, that this represents real value as well as durability. Few people realise that their currency which they call money has nothing to do with real money at all. All paper currencies are ephemeral and return to their intrinsic value of zero. This is because reckless governments cling on to power by printing or borrowing endless amounts of fiat money in the hope that they will placate the people and buy votes. 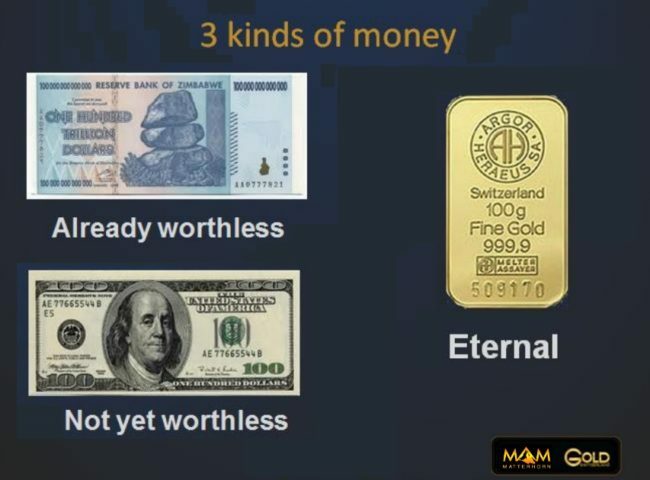 Fiat money as the name indicates, can never be real money. It is issued by edict and is not backed by anything but debt and liabilities. Power corrupts and money corrupts. It is a lethal combination which not only destroys people but also nations. And sadly, we have now reached a point in history when the unlimited amounts of fiat money that have been created will also destroy continents. To understand what money is and isn’t, we can just look at the example below. Most people in Zimbabwe believed that their currency was money and that it represented reward for labour and or production. But as the irresponsible regime started to run out tricks to cover up their total mismanagement of the economy, they had to print endless amounts of money until the point when even the 100 trillion-dollar note was totally worthless. 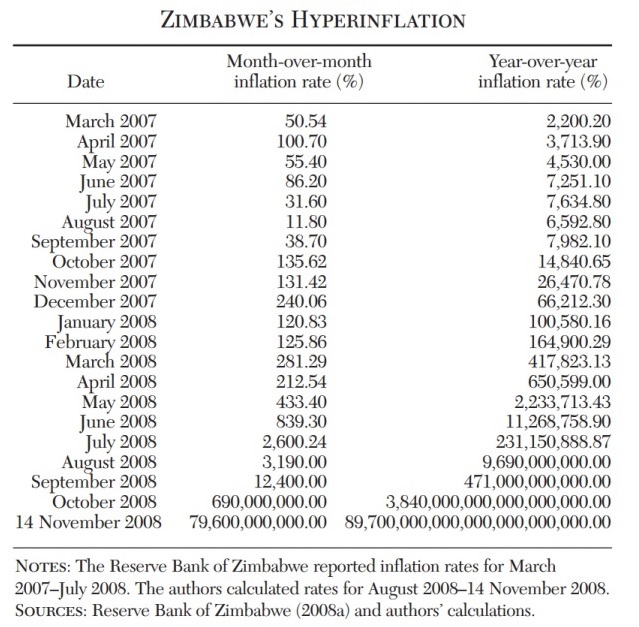 Inflation in Zimbabwe rose exponentially. In 2008 annual inflation was estimated at 90 to the 21 percent (or roughly a 10 with 40 zeros). What happened in Zimbabwe is an excellent example of how a prosperous country can be destroyed by total mismanagement. The country had a very successful agricultural sector, mainly owned by Brits from the South Rhodesia era. It also has considerable mineral resources. But the value of this was gradually destroyed when the country became independent. And during that tragic decline of Zimbabwe, private land was expropriated and enterprise was nationalised. So Zimbabwe is an excellent example of how to destroy a currency by killing private enterprise and replacing it with government interference and control. There are many examples of this in history. The partition of Germany after WWII is the best proof how a country’s economy can be destroyed with disastrous policies – a West Germany, a prospering free market economy and East Germany, a centrally steered and poor communist economy. The decline of the US dollar has been a lot faster than most people realise. In 1971 the $100 bill note above would have bought the 100 gram (ca. 3oz) bar pictured. Today it buys just a small corner or 3% of the gold bar. But the US$ is not the only currency in the race to the bottom. All major currencies compete successfully in this race and that includes the Euro, Yen, Pound and all other currencies. The graph below shows gold as real money and stable purchasing power (straight line at 100). Gold does not appreciate. It performs the function that money should do. It represents stable value just as it has for thousands of years. One ounce of gold bought a good suit for a man 2,000 years ago, also 100 years ago and still does today. This is exactly how money should perform. It should maintain its value over time. 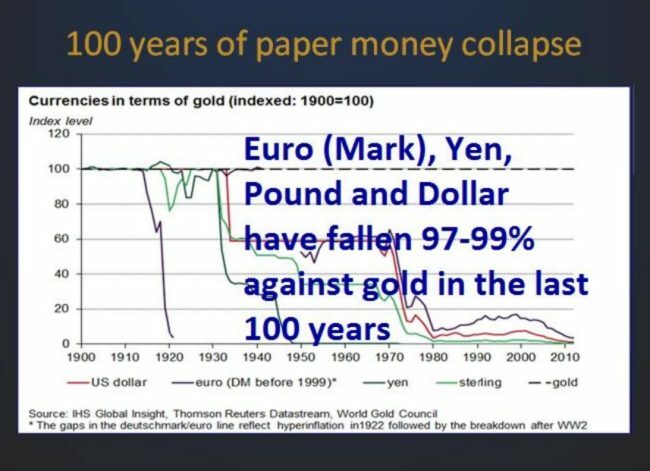 But if we then look at the graph below, we see how all currencies have lost 97-99% against gold in the last 100 years. As the graph shows, the dollar, euro, yen and pound have only 1-3% to go to reach zero. It is virtually guaranteed that this final fall will take place and it is only a question of how long it will take. With the exponential growth in debt accelerating strongly since 2006, we could very well see this final destruction of the currencies in the next 5-7 years. And if the debt doesn’t cause the collapse, so will the $1.5 quadrillion derivatives do as counterparty fails. Zimbabwe is an excellent example how what was meant to be money and a store of value just turns into a worthless promise that could not be used for any transaction or exchange. In the final stages of the hyperinflationary period the people either demanded dollars or gold. It is so fascinating that the destruction of currencies has been the norm throughout history as no paper or fiat currency has ever survived. Therefore, there seems to be little hope to permanently introduce a sound money system. Yes, there have been periods of sound money but they are seldom long lasting. Power seems to have such a corrupting effect on everyone who enters politics that the urge to print and spend worthless paper money seems completely irresistible. The simple solution would be to firstly get rid of all central banks because central banks is the main reason why money never remains money but always returns to just the value of the paper it is printed on. Central banks perform two principal functions. They artificially manipulate interest rates and they print money. By manipulating interest rates, they destroy the natural laws of supply and demand. If there is high demand for money, interest rates will in a free market go up to dampen the demand for money. Also, higher rates properly compensate depositors for the increased risks they take. What is happening today is the total opposite of a free market. Global debt has grown over ten times in 25 years and interest rates are zero or negative. This is financial repression or manipulation of a degree never seen in history. It totally destroys free market forces and is therefore the seeds of a financial Armageddon never seen before. Whenever natural laws of supply and demand are interfered with, it always has severe consequences. One thing is certain. The current financial system will not survive because it is based on principles which are not sustainable. In such a defective system, there is no sound money. What is also certain is that gold, as the only real money, will continue to reflect the mismanagement of the world economy as the currencies in the next few years finish the move to zero. Tagged 3 kinds of money.